Turning 18 can be scary and exciting. A lot is going to change in the life of that special new adult in your life. As they take the first of many steps into adulthood with this birthday, show them how much you care and want to help them through the changes that are ahead. The religious section offers many inspirational Bible verses to show them that God is with them through these times of change and uncertainty and that there is a plan for their lives, though they may not see it yet. The heartfelt section brings joy and warmth to this wonderful occasion and shows them how proud of them you are for the person they are becoming. The funny section provides ready made jokes for those who love to bring humor to any situation. No matter what your relationship to this person or what the message you want to provide is, you can find the perfect message for your 18th birthday card here. 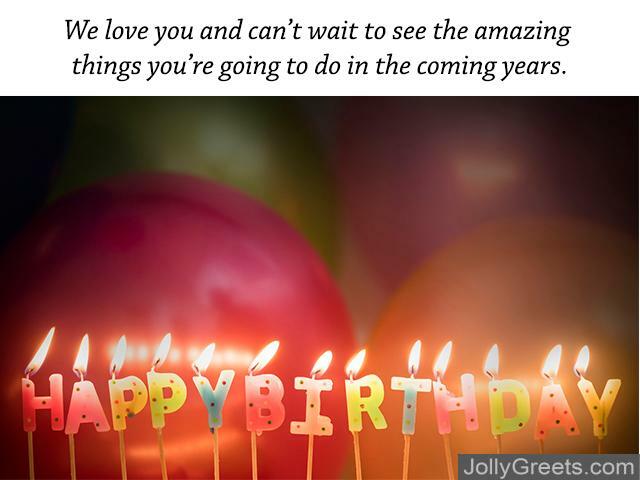 Religious: These 18th birthday card messages are here to tell the person that you love and care for them and that God is there in this time of change. These messages will guide them with advice straight from the Bible. “For we are God’s handiwork, created in Christ Jesus to do good works, which God prepared in advance for us to do – Ephesians 2:10.” I know that God has great things planned for you and you will accomplish his wonderful works. “For I know the plans I have for you,” declares the LORD, “plans to prosper you and not to harm you, plans to give you hope and a future – Jeremiah 29:11.” God knows his plans. You may not know what they are, but he has plans for you and they are great. (from mother) “A woman giving birth to a child has pain because her time has come; but when her baby is born she forgets the anguish because of her joy that a child is born into the world – John 16:21.” From the moment you came into this world I knew this day would come and I would be so proud of you, but I never imagined how amazing you would be and how proud I am that God allowed me to be your mother. “For through wisdom your days will be many, and years will be added to your life – Proverbs 9:11.” May the Lord give you the wisdom that only He can and may he lead you in the direction you should go. “You make known to me the path of life; you will fill me with joy in your presence, with eternal pleasures at your right hand – Psalm 16:11.” As you become officially an adult may you always remember that God will take care of you. One thing I ask from the LORD, this only do I seek: that I may dwell in the house of the LORD all the days of my life, to gaze on the beauty of the LORD and to seek him in his temple. For in the day of trouble he will keep me safe in his dwelling; he will hide me in the shelter of his sacred tent and set me high upon a rock. Then my head will be exalted above the enemies who surround me; at his sacred tent I will sacrifice with shouts of joy; I will sing and make music to the LORD. Hear my voice when I call, LORD; be merciful to me and answer me – Psalm 27:4-7.” May you seek God and his kingdom in everything you do. “Because of the LORD’s great love we are not consumed, for his compassions never fail. They are new every morning; great is your faithfulness – Lamentations 3:22-23.” May you always remember that God is faithful. 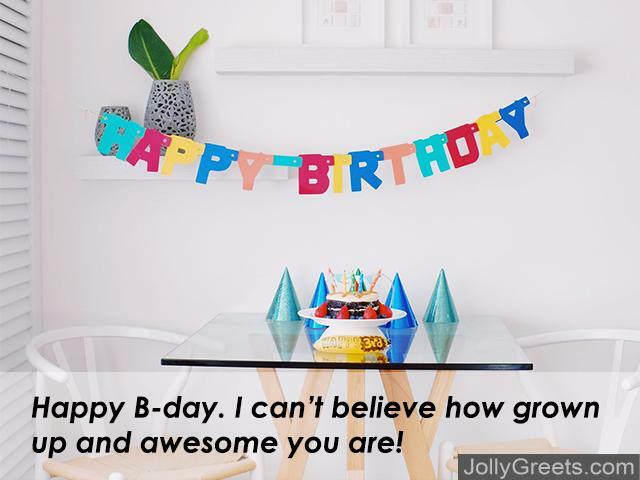 Heartfelt: These 18th birthday messages show the person that you support their future and their goals, which is important no matter what your relationship with the new adult. Happy B-day. I can’t believe how grown up and awesome you are! You’re 18 now. There’s so much in front of you to look forward to. We love you and can’t wait to see the amazing things you’re going to do in the coming years. Remember, no matter how old you get or how far you go, you can always come here and find a home with your family and friends. Don’t forget your peeps when you get out into the world and do great things. Remember we love you. Happy birthday. Celebrate, because you deserve it. (from parent) Remember that I will always be here for you and will always look after you no matter how old you are. Happy 18. 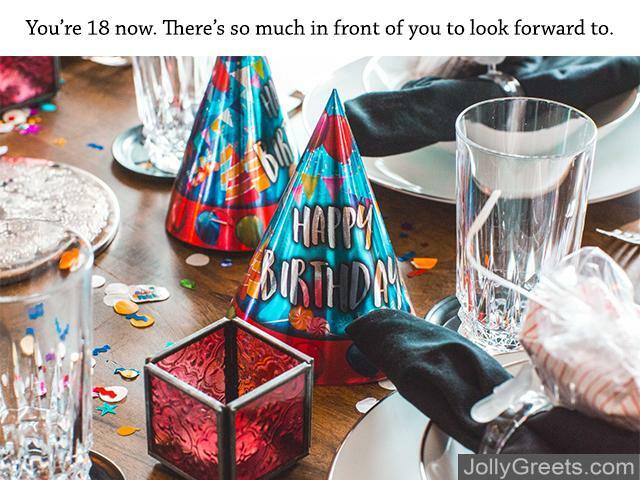 Funny: These hilariously relevant 18th birthday card messages provide humor and laughter, so they have a joke about their life to think about for years to come. (from sibling) Can I have your room when you move out and move on with your life? (from parents) Don’t forget when you move out and make money, we want to be compensated for all the years of spending money and time on you. (from parents) Does becoming an adult mean that there will be grandchildren soon? 18? Are you sure? You act and look a little older than 18. 18, look how old you’re getting. Seriously, how much older do you plan on getting? (from parents) Yay, you’re 18 now. Now get a job and get out of our house. (from sibling) You know, now that you’re a grown up, you really should give me everything you used to love when you were a kid. You can’t have baby things hanging around.